It’s a bit convoluted, but it works. The idea is that the MC-6 can control the H9s, and also the Octatrack. The Octa’s MIDI THRU goes to the H9s, which lets them receive the original MIDI signal. The Octa’s MIDI OUT goes back into the MC-6, and magically also gets sent to the H9s. This is to send the Octa’s MIDI clock and transport to the H9s to sync them. This all works, amazingly. 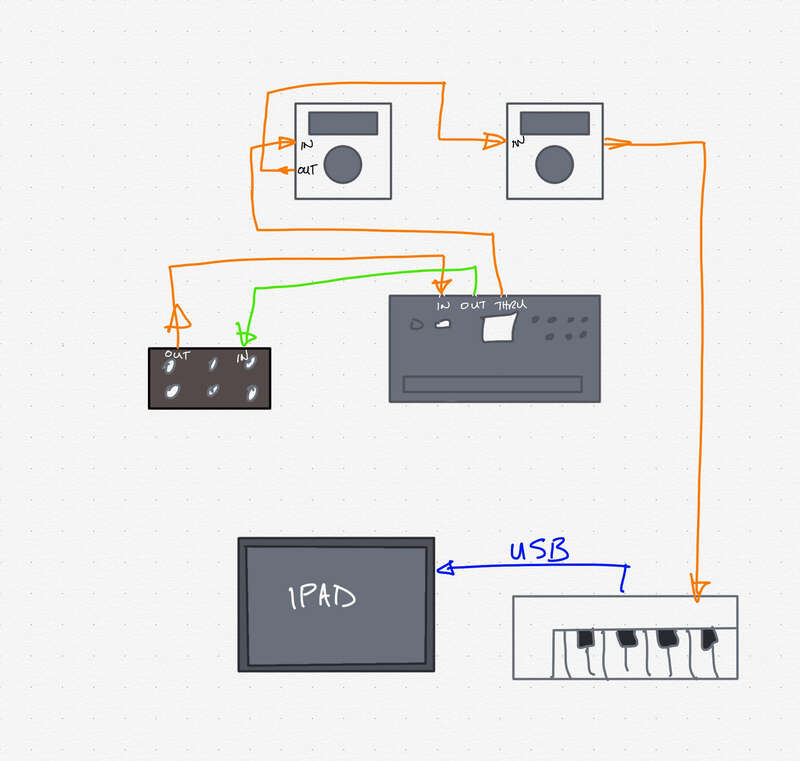 But if I want to send the MIDI to the iPad, I have to put the Arturia Keystep in there to act as a DIN-to-USB adapter. That seems a lot simpler. Does the routing work like this? Hey, I have a mio4, so I may be able to help. What do the green/orange arrows from the mio to the H9s represent? Nevermind, now I understand. This would totally work. Thanks! I was wondering whether the inputs signals could be sent on to all the outputs. Yes, you can connect an input to multiple outputs, and also apply message filtering if needed. I think the default is to just send every input to every output, except for the same output pair. If you want help with iConfig (the configuration software) just ping me. Also, I would suggest going for a mio4 right away (more inputs, and USB host), though I just noticed that it's much more expensive. Thanks! The Mac software is quite confusing, and the iPad app doesn’t see it at all. I wanted something as small as possible. I have other midi gear, but it’s all USB, so this is perfect for now. Ah got it, and yes, the iPad app is terrible, if it works at all. There is a newer Mac app, that you can use interchangeably, which simplifies things, but I have no experience with it. I tried the new app first. But it’s too simple. Most of the functionality isn’t there. Isn't it better to have a small keyboard for note entry, playing synths, editing data or additional remote control on the iPad? That’s a good point, but my main instrument is guitar. Also, the Keystep takes up a lot of desk space. I bought a Mio 2 and it works as expected. Another advantage is that, previously, I had to power up everything in the chain to get the midi signals all the way through. With the Mio hub, I only need to power what I’m using (plus the hub of course). 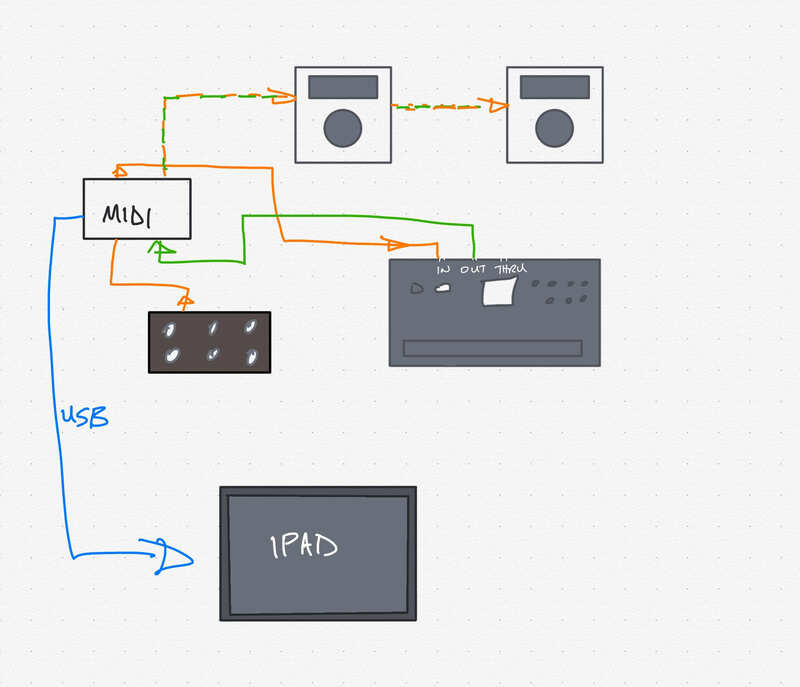 I thought about that, but then all midi needs to be routed through the iPad, instead of inter-device. Does it matter? I have used aum as a midi router for quite a while in various kinds of different setups and never had problems with it. Sometimes I want to play without hooking up the iPad. Does the Mio work standalone, without being connected to a computer? Sometimes I get an orange LED on the power light when I switch it on, and nothing works. I wonder if that’s related? I answered my own question: no. The Mio2 doesn’t act as a USB host, so it requires a computer to work, even to route midi between DIN ports. Back to the store it goes! Ah, ok. Then perhaps it should work. What happens is that when I power it up (when not connected to an iPad/Mac), it shows the power light as orange, not green. Nothing works. No midi is passed through it, and the button on the front does nothing. How are you powering it when not connected to an iPad/Mac? Powered USB hub. The same one that I use with the iPad, when I connect it. Shouldn't you have purchased the iConnectMIDI2+ instead? It's the one you can connect and charge your iPad with. Hmm, that should work. And you are using the second port, right? I am. The one used to power it. The other one does nothing at all, power wise. Perhaps my saved configuration isn’t sticking? I don’t need the audio part of that, and it’s more expensive. Not really. You might be mixing up product names. Street price of iConnectMIDI2+ is about $15 above the mio2. That could certainly be the case. But I definitely didn’t want audio, as I already have two boxes fighting for my iPad’s audio attention — a USB-C hub, and the mixer. Anyhow, I’ve gone back to my original setup, daisy-chaining everything. I dug out an old MIDI-to-USB cable to hook up the iPad when needed. One major point of using hardware like the Octatrack is to be able to just switch in and start. That means the setup has to be rock solid, otherwise I might as well just use iOS . So, back to my messy-but-reliable solution. I don't find your first setup messy at all. If it works then it's great!